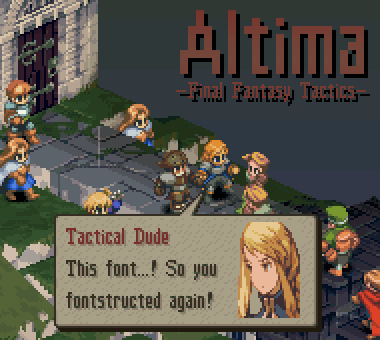 Altima is not the first recreation of the original PSone Final Fantasy Tactics font on the web, but certainly the most accurate and comprehensive you'll find. The font is based on the complete set of the game's international bitmap glyphs and thus also features the Japanese hiragana and katakana alphabets as well as countless additional stuff like a cyrillic base character set, special characters, zodiac signs, and whatnot. The base font size and recommended setting for Altima is 16pt and multiples of that. Use metric kerning and no additional smoothing effects for the ultimate FFT experience. Final Fantasy Tactics on the PlayStation was developed by Square and published by Square & Sony in 1997. Info: Created on 18th August 2015 . Last edited on Tue, 29th January. Nice work! FFT is one of my favorite games of all time.